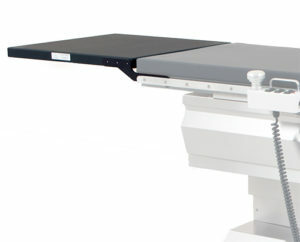 The first Imaging table designed for use with FD C-Arms. Install or remove optional headrest or extensions in seconds! For cord-free floors and instant on functionality. 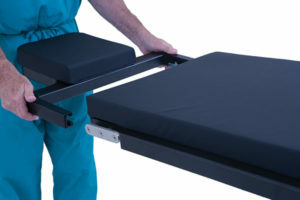 The first Imaging tables designed for use with FD C-Arms. Helps optimize image quality and dose with a higher travel height and lower tongue profile. 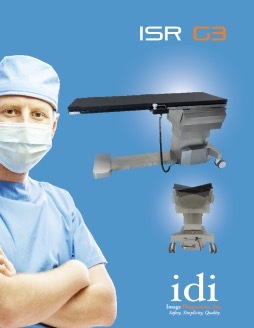 The Aspect ISR G3 is the flagship of the Aspect™ Series table line; designed to be the preferred imaging solution during interventional and vascular procedures. 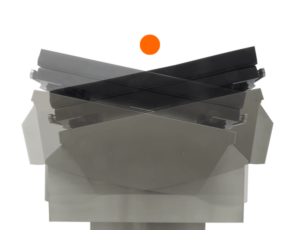 Featuring true iso-centric lateral roll – anatomy on the iso axis remains centered in the fluoroscopic field of view. 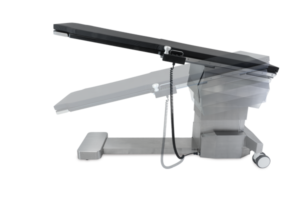 The ISR G3 provides longitudinal tabletop float of 32 inches (81.2 cm) in a very compact platform enabling comprehensive coverage throughout the anatomical imaging area without C-arm movement – and does so in a table with an ideal overall length of only 84 inches. 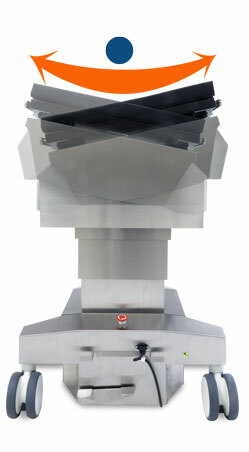 With the addition of the optional head extension, the imaging area is increased to 80″ (203cm). Elevate and tilt functions are fully motor driven – no hydraulics – lower cost of service and no dangerous oil leaks! Clamp-on Accessory Rail A100-1007 Rail is 6″ long x 3/8” thick x 1-1/8” high. Arm Board A310-056 Quick-release, rail mounted. Requires Clamp-on Accessory Rail A100-1007. 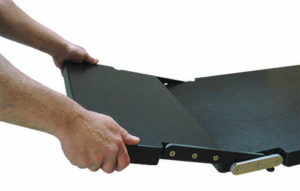 Arm Board A310-059 Carbon fiber, shoulder mount (attaches by sliding thin section under patient/table pad), flat. Includes pad and strap. 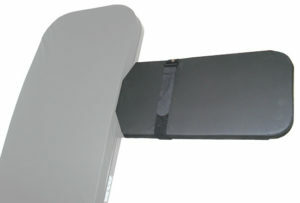 Headrest Extension A100-2317 Articulating carbon fiber headrest, Attaches to the imaging end of the table. Requires the table to have an X100-2492 style tabletop. 23-1/8” wide x 12” long. Tabletop Catheter Tray Extension A100-1769 24.25” wide, 30” long. Mounts to pedestal end of table only. The maximum weight this extension can support is 20 LBS or 9 Kgs. 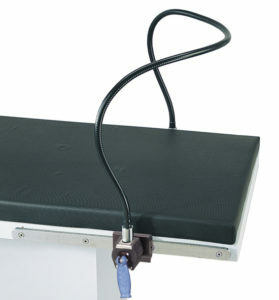 Tabletop Catheter Tray Extension A100-2322 20 3/4” x 27” long. 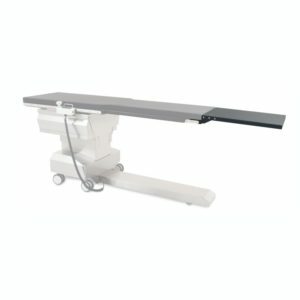 Mounts to imaging end of table only. Requires tabletop X100-2492. The maximum weight this extension can support is 20 LBS or 9 Kgs. 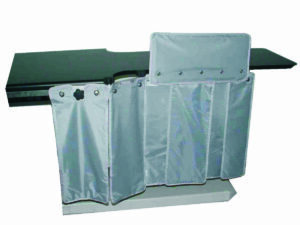 Radiation Shield A610-051 Articulating, rail-mounted. 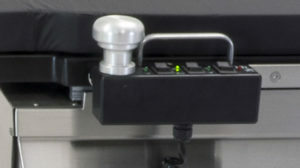 Attaches to table side-rail at base end of table, either side, adjustable. 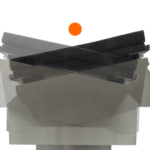 Articulating joint allows shield to conform to table contour. Snap-on upper section above level of tabletop is removable. Anesthesia Screen Holder C000-0965 Flexible “hoop” style. Mounts directly to A100-2317 Headrest Extension. For use on accessory rails – a pair of rotating side rail clamps, part number C000-0746, are required. 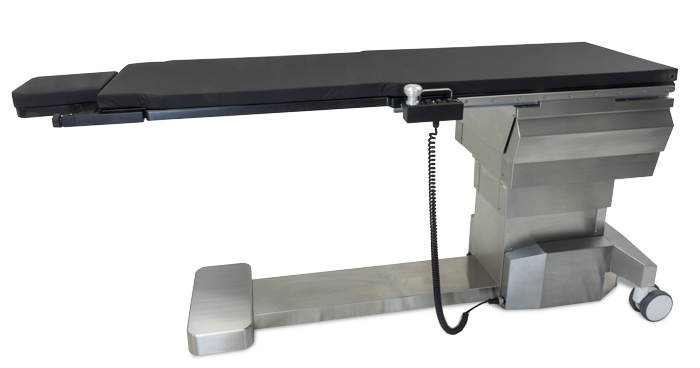 Rotating side rail clamps and clamp-on accessory rails are not required if table is ordered with the A100-2317 Headrest Extension. 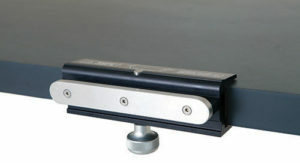 ISR Table Foot Switch with Safety Hood A000-2071 Foot control for Aspect ISR G2 table. Foot control motions are: iso-roll, transverse travel, elevate/lower and Trendelenburg down/up. (Safety hood helps avoid accidental motorized table movement from foot switch). 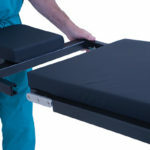 IDI Medical Grade Anti-Fatigue Mat C000-1181 22” x 66” (59cm x 167cm) Heavy-duty, one-piece construction for high-traffic areas. Safe & non-toxic, contains no plasticizers and will not leach over time. Durable brushed texture. 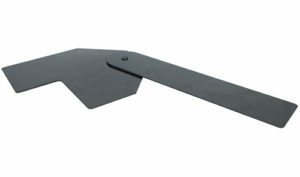 Surface is puncture & abrasion-resistant. Antimicrobial properties for added protection. Stain & chemical resistant. No-curl, beveled edges that reduce tripping potential. Non-slip bottom certified by the National Floor Safety Institute. 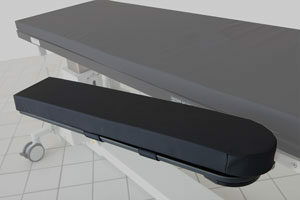 VAB Armboard A100-2244 Carbon fiber, one-piece, extra wide armboard for vascular access procedures (body section slides under patient/table pad). Includes strap and pad. Install or remove the headrest or extensions in seconds – no additional accessories required. Full battery operation for cordless floors – and instant on functionality when batteries run down and table is plugged in. No waiting for table charge to build. Trendelenburg Tilt: ±12° with automatic “stop-at-level” positioning and longitudinal safety lockout when in trendelenburg. Transverse float is available regardless of tilt or roll position. Elevation: 31” – 43” (84-109cm) without tabletop pad. 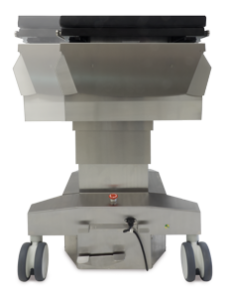 Imaging area at full longitudinal extension = 80″ (203cm) with optional headrest attached and 61″ (155 cm) without optional headrest attached. 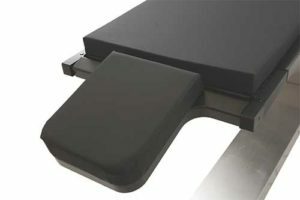 Tabletop Pad 2” thick, memory foam construction. 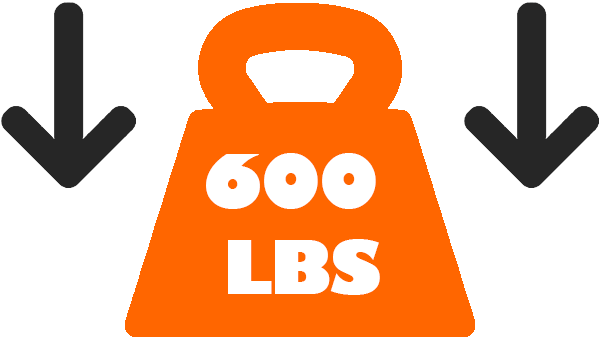 Patient weight capacity: 600 lbs. 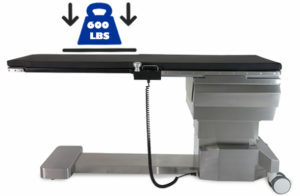 (272 kg) with full table functionality at max. patient weight. 115VAC < 10amps, 230V optional. 20’ (6 meter) power cord.